Locations do not get much better than this. Situated in the heart of the historic centre, surrounded by the Plaza de Toros, the Guadalquivir River and La Maestranza Opera House. Seville's most famous tapas bars and restaurants are on your door step. The Giralda is just 2 minutes away. The famous Semana Santa parades come directly under the apartment windows and it is a short walk from the Feria district. The apartment has recently been refurbished and has fine high ceilings, wooden floors and French windows to the street. 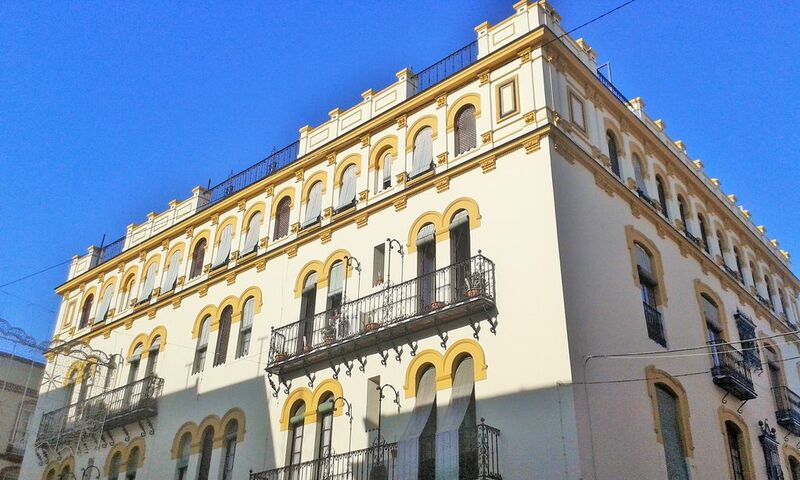 All rooms have air-con, very important in Seville! Bedroom 1 has a double bed and two French windows looking onto the street. Bedroom 2 has two single beds with a large French window facing the Calle Iris (the street that the matadors walk along to enter La Plaza de Toros!). Granada (and Sierra Nevada) 160 miles. Brand new bathroom with large massage shower, wc and bidet. Integrated in the living room. While the apt. Was nice, the street it is on is like a freeway. There is also a noisy restaurant across the street that doesn't really get going until 10:00-11:00 p.m. People are noisy, yelling and there is a band on Sat. Night that is really loud. There are shutters on the windows that help but do not block the noise. Worst experience, I came away needing a vacation. We regret that the noise was a significant disadvantage for you during your stay and appearantly no positive points were considerable. I just can add from my side, that this location, in the very heart of a Spanish city, quarter El Arenal, next to the bull ring and in an area with many restaurants and tapas bars, can hardly be quiet. Nevertheless, we have double glazed windows and noise is usually not an issue for our guests, but it depends of course on personal impressions and habits. We are used to reviews of 4 and 5 stars. This is our third stay in this apartment and each time we have grown to love the apartment and Seville more and more!! The flat is bright, well furnished and equipped and the location great. Would highly recommend this apartment. This really was a spacious apartment.And it was convenient for the Alcazar and Cathedral. There were lots of restaurants and tapas bar nearby. Spacious well appointed appartment within easy walking distance of all main visitor attractions. This is a comfortable, clean, very nicely decorated appartment that is ideally situated as a base for visiting the splendid city of Seville. The WiFi is fast and reliable, the double bed large and comfortable and the kitchen (for those who want to cook for themselves) is well equipped. We were welcomed by an extremely pleasant member of a management company who gave us very good advice on finding authentic flamenco venues. We were also very grateful that we were given access to the appartment earlier than usual as there were no other "renters" before us. The fact that the appartment is in a busy area which can be noisy (the double glazing has some effect but obviously can't cut out all the noise) was not concern to us as we always travel with good ear plugs when we go on city breaks. We slept well. Over all the stay was a positive experience although 2 things were a cause for concern. The water heater works very well but it is far too small. We were just 2 people and we ran out of hot water after 2 showers (and 1 long hair wash!) the first morning. For 4 people plus washing up it would not be anywhere near sufficient. The main problem however concerns the keys. There are 3 keys to use.... outer door late at night, inner security grill and appartment key. The only key that works easily is the one for the inner security grill. We wasted so much time trying to use the other keys that it became very frustrating. We would definitely return to this appartment.... if the locks were changed! Thank you for leaving us your review, much appreciated. Just to add a few notes from our side: We usually do not receive any complaints about the hot water supply. It is a 100 liter tank which is normally enough. Once consumed, it needs of course some time to heat the same volume of water up again. Regarding the keys, we know the locks are tricky, but the main lock of the house cannot be changed easily, it is a large community of neighbours and not in our hands. The keys are OK, but the lock is tricky. We usually try together with our guests upon arrival, so they can practice how to open the doors. It was a pleasure hosting you - hope you come nevertheless back one day. Costa de la Luz is one hour away. Costa del Sol is 2.5 hours away. Seville Airport (SVQ) is 20 minutes drive. It is not necessary to hire a car as cabs are cheap in Seville. If you do arrive with a car, the apartment is next to a reasonable municipal car park under La Plaza de Toros (Parking Paseo de Colon). Should you want to use Seville as a base for exploring Andalucia, Jerez is only a 30 min journey; Cordoba, Cadiz and Ronda are just over one hour away and Granada is approximately 2 hours drive.